The main motto of OK! North East is to allow a visitor to ‘live like a local’! From Tailor-Made itineraries to experiencing a place like a local, OK North East is adding a big dollop of imagination to the process of booking an adventure or experience trip or an accommodation at a stunning yet unexplored place in the Northeast of India. U Soso Tham – born in 1873 in Sohra, or Cherrapunjee, Meghalaya, was a Khasi poet. He was the first poet to initiate secular literature with diction, both singular and genuine. He was also the first person to make use of Khasi idioms in a form taken mainly from English poetry. 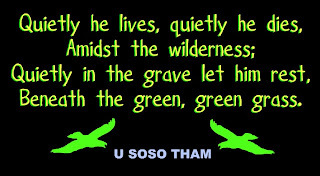 U Soso Tham is basically remembered for his beautiful poems. His “Ka Duitara Kshiar” (The Golden Harp, 1925) – a compilation of poems, is one of the most distinguished works. U Soso Tham was born to a very poor family. He was the third and only son in a family of four children. His father was Hat Tongper and mother, Lyngkien Tham, was said to be a very pious woman. Due to acute poverty after his father’s death he had to discontinue his studies after eighth standard. Despite his little formal education he rose up to a level of a high school teacher and excelled in his teaching career. 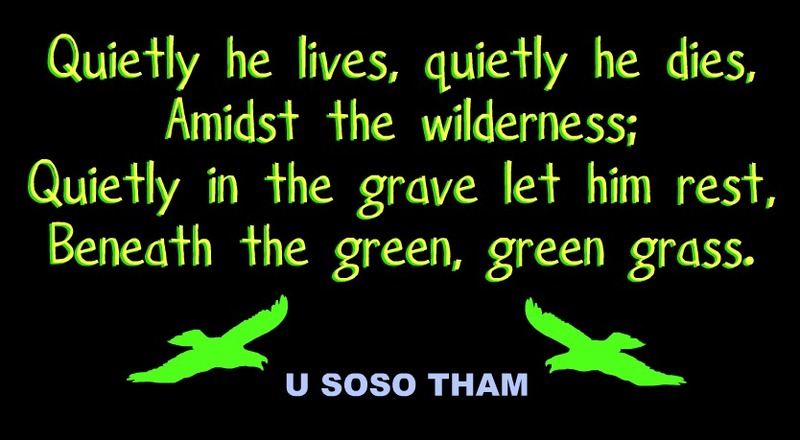 Soso Tham has got two volumes of poetry to his credit - Ka Duitara Ksiar (The Golden Harp, 1925), comprising 46 short poems, including lyrics, ballads and nursery rhymes, and 14 translations of various English poets. His another creation “Ki Sngi Ba Rim U Hynniew Trep” (The Olden Days of U Hynniew Trep) (1936) is a bright star in the Indian literary sky. This is a single long poem having 181 stanzas of six lines divided into 10 sections, each under a separate heading bearing unique names. The poem is about the Hynniew Trep people, ancestors of the seven Khasi sub-tribes comprising, the Khynriams in East Khasi Hills, the Pnars in Jaintia Hills, the Bhois in Ri Bhoi District, the Wars in the foothills bordering Bangladesh, the Marams, Lyngngams, and the now-little-heard-of Diko in West Khasi Hills. Tham had also translated Aesop’s ‘Fables’, Charles Dickens’s ‘The Life of Our Lord’ and the great Shakespearean comedy ‘The Tempest’, to which he had given the title of ‘U Kyllang’. Unfortunately the manuscript of this translation was lost and not recoverable. With him to eat and drink is owed! Soso Tham’s life was not easy. He had to go from house to house like a peddler to try selling his first published work, Ki Phawar U Aesop (Aesop’s Fables, 1920), which has become the most widely read book in Khasi society today. In his personal life So So Tham received injustice and hatred. Some intellectuals even ignored him and his creations, considering him a half-learnt mad teacher. They did not assist him in bringing out his creations into light. Only an illiterate fan of him assisted him with financially to bring out his first book of poetry “Ka Duitara Kshiar”. He worked as a teacher of Khasi in Shillong Government High School, Mawkhar (the only high school in the Hills in those days) from October 12, 1905 to July 30, 1931. He took his last breath on December 18, 1940 and not only Meghalaya or the then Assam, but the whole Indian literary world lost him forever. So So Tham will always remain as the greatest literary icon in the history of literature of Meghalaya. Dr. S. K. Bhuyan, the prominent historian of Assam, called him the Robert Burns of the Khasi Highlands in his book ‘Studies in the Literature of Assam’ (1956), which also contains a chapter on Modern Khasi Literature. Lastly I would like to say to the tune of Wahlang, “Erase out U So So Tham or belittling this superman in Khasi literature, then the Khasis are left without the reminiscence”. An awesome poet of then Meghalaya. Thanks for posting. People should remember the good things. please upload the full contents of "Ka Duitara Ksiar" on the website as most of the students studying outside Meghalaya can also get access to those poetry. I know that we have read them during our school times but we need to refresh our mind with what Soso Tham had written and encourage us. Wonderful and its amazing to know such type of old history for our generation.We have to learn and practice all these. Do not Spam. Stay on topic. Do not include links to websites and videos not associated with the topic. Do not post the same comment multiple times. Do not post anything defamatory, harmful, abusive, racially objectionable, or otherwise illegal. If you violate these rules, your post will be deleted.